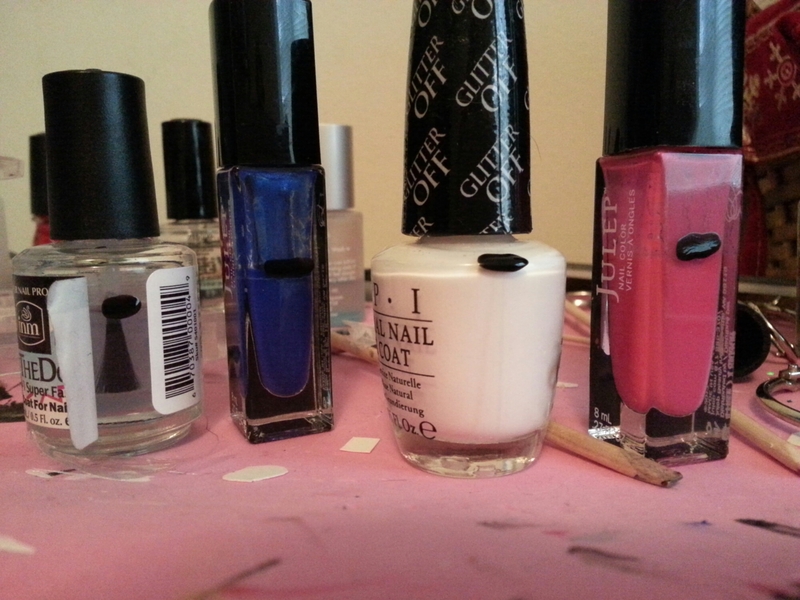 I have a lot of nail polish. Hundreds of bottles. I destashed some last year and passed it on to family and friends, only keeping things I really like. And still, hundreds of bottles. I like glitter. What can I say? While I won’t stop acquiring polish unique to my collection, I also don’t want the ones I have to go to waste or remain unused. So I am embarking on a small project polish this year to see if I can use some of it up, concentrating on the colors that I have a lot of shades of: blues, purples, and pinks along with base and top coats. From left to right, firstly we have Out The Door fast drying top coat. It’s an average one at best – comparing it to Seche Vite or my new favorite Clearly On Top, it doesn’t dry as fast, smudges nail art, and doesn’t have a very glassy texture when dry. I have been using it as a barrier between base color and nail art in case of mistakes. Next to that is Julep’s Ally. It’s a beautiful electric blue. I’ve been using it as a nail art base and as the second layer of galaxy art. I will be sad when this one is gone! Next is O.P.I.’s Glitter Off base coat. I’ve tried this as a base coat and didn’t like it for that purpose. I didn’t have staining, but the glitter didn’t peel off any easier than it would without it. Thick coats, thin, with another base coat, without. What it works really well for is keeping polish off the cuticles and surrounding skin when stamping or sponging. Its properties are exactly like Elmer’s glue, so once this is gone, I’m going to use that. Finally, there’s Julep’s Reagan. It’s a beautiful bright pink one-coat cream that I use as both a base and for art. Although it takes a long time, it’s not impossible to finish up a color. Even a standard 15 ml. These Juleps are smaller – 8ml. I feel the value is comparable, though, as most 15ml polishes require two or more coats for opacity and most of my Juleps and Zoyas are one coaters. I will cycle in some of my 15ml bottles as I use things up! This entry was posted in Nail Polish Collection, Project Pan, Project Polish and tagged julep, kb shimmer, nail polish, o.p.i., out the door, Project Pan, Project Polish, seche on January 2, 2015 by Mel.